There are thousands of books, articles and blog posts about what to do in Rome. I think it is probably safe to say that the must-see list is well covered and I have every confidence that every tourist to the Eternal City will know that the Colosseum and the Spanish Steps are places they must visit. Still, there is more to the city than just seeing the sights and for me, the experiences are what make any trip great. Here are four of my favorite Roman travel moments. 1. Walking across the Ponte Sant’Angelo – The Vatican is one of the most popular tourists spots in Rome, even if it is a sovereign nation. Everyone, regardless of faith, should visit the Vatican at least once in their life; it truly is a remarkable experience. As I left the Vatican, I walked towards the Castel Sant’Angelo, and paused to look behind me. I had escaped the ever increasing crowds in the Vatican, and had a moment to look back at St. Peter’s Basilica and reflect. I definitely wasn’t alone, there were tourists around, but unlike in the Vatican I found a spot where I could plant myself and just spend a few minutes admiring the beauty and the history of the area in peace. I glanced to my right and noticed the Castel Sant’Angelo and a bridge, the Ponte Sant’Angelo, leading back into Rome proper. 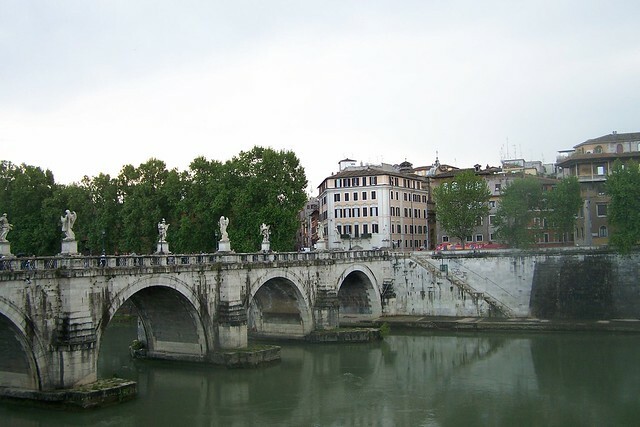 Crossing the bridge, with Roman statues on either side, I felt for the first time that day that I had done it. I was really in Rome and experiencing the intangible something that makes Rome great and brings people back again and again. 2. Piazza power – Rome is a city of piazzas, squares featuring a fountain or obelisk usually around which neighborhoods are centered. Some are famous, some are not, but all offer a great way to experience different aspects of the city and to get to know it just a little better. One of my favorites is one of its most touristed, the Piazza di Trevi. Even though you will be joined by a thousand or so of your closest friends, the fountain and surrounding area is gorgeous and offers a moment of living in the postcard that is Rome. Walking away from the Piazza di Trevi is even better as you wind your way through the narrow alleyways and streets, exploring hidden side streets frequented only by a few residents. Piazza Navona is another favorite, although its scale is much different than Trevi. Navona is larger and more open, with a famous fountain and obelisk of its own at the center. Surrounding the piazza are some high end restaurants, artists and Romans out enjoying the day. No matter which piazzas you discover, make sure to spend some time in them and enjoy the moment along with everyone else. 3. Forum view from Palatine Hill – Ok, I said I wouldn’t cover the standard touristy spots, but I can’t resist this one. After we toured the Colosseum, we walked across the way to the Palatine Hill to start our exploration of the Roman Forum. The Palatine is the oldest part of the city and later in its history was home to the wealthy elite of Rome. We toured the ancient palaces, mere shadows of their once glorious selves. It was busy, but the area wasn’t packed. I think most people must bypass the Hill and head straightaway to the Forum instead. As we walked along, we reached an overlook and the ancient Roman Forum spread out before us. No one was around us at the moment and it was a rare instance of solitude in the city. I thought about what it must have been like to have lived during the reign of the Romans, servants running down from the palaces we just left down to the Forum to conduct business for their masters. For a second or two, it was possible to really cast ourselves back in time and understand, maybe for the first time, just how great Rome really was at its peak. 4. Food, any food – I hesitated adding this, since the culinary side of Rome is perhaps one of its best known, but I enjoyed it so much I have to include it as a top experience. There are some countries in the world where it is hard to go wrong when deciding where to eat, Rome tops this list. Pizza, pasta, gelato – it’s all here, along with higher end choices as well. Everything we ate was the best FILL IN THE BLANK we ever had. Spaghetti Carbonara? The best. Gelato? The best. Pizza? The best. You see where I’m going with this. Our hotel was next to the Pantheon and the location was perfect not only for touring, but for discovering some great restaurants. With our backs to the Pantheon, we strolled along the Via della Maddalena, taking our time, enjoying the evening and pausing to look at cafe menus until we found one that was reasonably priced and well patronized. The next few hours, because a Roman meal cannot be rushed, were just perfect. It was more than just the food, which was excellent, it was sitting outside in the warm evening, watching the world go by and enjoying what it means to be in Rome. I couldn’t have planned a better experience if I tried. What are some of your favorite moments in Rome? Love these photos! I could really feel the charm of Rome exuding from them. Wish I was there now. Yay!! I just LOVE seeing non-toruisty suggestions for Rome!! I’m an American who lived in Centro Storico of Rome last fall, while completing an internship for the U.S federal government. It has become my adopted home and I am working so hard to return. If you let it, the city will steal your heart in an instant. I just want to elaborate on a couple of the things you mentioned, that I was lucky enough to experience. My favorite piazza in the whole world-Piazza del Popolo is a stunning site but it’s best feature is that it is just below Villa Borghese-Rome’s Central Park, per se. It is a beautiful heart-shaped park in northern Rome, filled with ancient ruins and beautiful sculptures, once being a private villa. Take the stairs on the left of the piazza up to the terrazza where you can get one of the best views of St. Peter’s Basilica and panoramas in Rome. At least one Roman sunset is a must from here! Castel D’St. Angelo is magnificent inside as well. Another spectacular view from the top and it’s no more than 10 Euro for entrance. For another great forum view, try Palazzo Senatorio, just behind the campodoglio.It is on the Capitoline hill. Absolutely the most sprawling view and fantastic day or night. Another tip-the forum stays lit ALL night and the crowds disappear by at least 11, if you really want a late night treat! I know exactly where the restaurant is in your pic and I have eaten there! Delicious pizza. There are so many amazing restaurants in Rome, but just as many with bad food that are trying to rip off foreigners. Be aware of hassling waiters outside harassing tourists in English-no authentic place would do it. The best deals are at trattorias where you can pay one price and get wine, water, antipasti, pasta, meat and dessert. Trastevere is a great area for this. Just make sure you have some Carciofi and Amatriciana at least once-my favorite Roman specialties!! Great suggestions!! Hope you had a wonderful trip to the Citta Eterna! Beautifully done Matt! You have captured the advice I always give to travelers who are headed to Rome with their list of “Must Sees.” I always tell them that Rome will open up to them and encourage them to wander and let serendipity into the picture. The sunsets are always amazing, and one should find a spot for an apertivo to enjoy them. Two of my favorites are the rooftop of the Hotel Raphael near Piazza Navona for the stunning views and the Rosati at Piazza del Popolo for the wonderful negronis and people watching. Watching the sunset is a great addition, maybe I should add that in. There’s another great spot at the restaurant at the Hotel de la Minerve near the Pantheon. I was in Rome just a month ago as well! My favorites were the Trevi Fountain, the Villa Borghese park and the Via Veneto area! I also liked the walk across St. Angelo bridge. The whole of Rome gives a great feeling in general! Piazza del Popolo is wonderful, especially at Christmas. The tree at the top of the stairs leading to Villa Borghese is beautiful. I was fortunate enough to be there when it snowed…the first time in 25 or so years. I also dream of going back to Trastevere. The memory of the food haunts me in the best of ways.